1966 : les meilleurs films de l'année. Announcer: An Enterprise Vineyard Production. 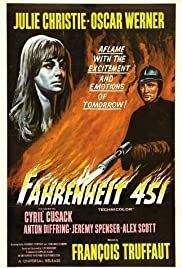 Oskar Werner, Julie Christie... in Fahrenheit four-five-one. while the movie itself isn't horrid, it is miles behind the book. no matter how good the actors themselves are(and these aren't too good), the emotions of this book just aren't transfered to screen. don't watch this movie. save your money and buy the book. i won't bore you with the plot as some people do(THESE ARE COMMENTS PEOPLE! NOT PLOT SUMMARIES), but i will give you this word of warning: the movie makes little sense unless you have read the book.